The Clippers and the Trojans played each other once again, in a very similar match to last Fridays. The outcome was a Clippers win in five sets. Starting the first set was a tight back and forth game between the two teams. Similar to the first match, but SAIT pulled ahead and took the set 21-25. In the second set, Briercrest pushed to win the set. The Trojans could not find anything to work off of near the end and the Clippers stole the set, the score was 25-22. In what would be another turnaround set for the Trojans, they came out and picked up synergy. SAIT accomplished this in the set, lugging ahead of Clippers finishing the set 23-25 in a huge team effort. The Clippers however; wouldn't give in and went off on an amazing set. A huge team effort finishing the set at 25-13. Going into the set that was a win or die for both teams. In fifth set, both teams came out hungry. It was back and forth action all the way coming down to who would make more errors. The Clippers eventually pulled ahead winning the set and the match, making for a Clippers victory. The final scores were 21-25 / 25-22 / 23-25 / 25-13 and 18-16. Player of the game for the Clippers was #8 Taylor Mitchell playing her last regular season home game for Briercrest as a Clipper. Taylor will be heading to Minot State University in the fall to continue her coarses in our joint programs. 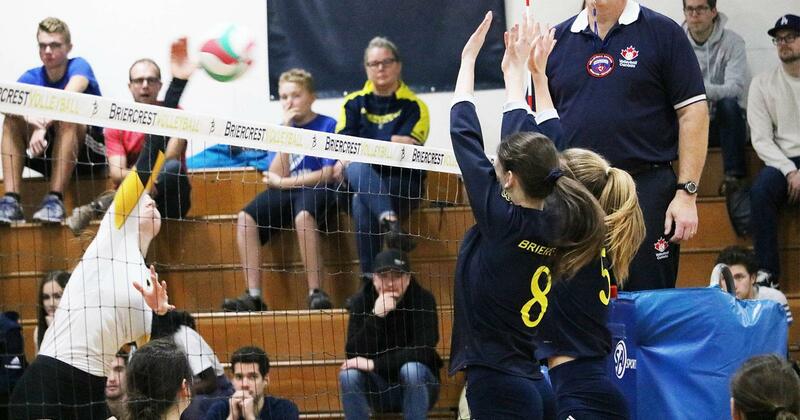 This was Taylor's 3rd year with Briercrest volleyball, she first played for JV team where she won JV Athlete of the Year before playing two seasons for the varisty team. The women are heading to Ambrose University for their final regular season games before plays off. Catch the game on ACACTV.ca.